In January of 2007 I talked to a lady in Cite Soleil who told me that UN helicopters had hovered over her neighborhood in late-December, 2006 and shot down on them. Three of her daughters were allegedly hit by these UN bullets as they were diving below their beds in the house. I examined the three girls and saw their bullet wounds. And I went to their house and saw the bullet holes in their second floor roof. The holes in the roof were “entry” holes. How did these bullet holes pierce the roof if they did not come from above? And how did the three sisters get shot if the bullets did not come from above? 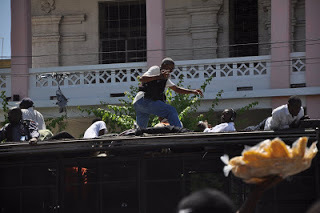 People diving for cover during shooting at Fr. Jean-Juste’s funeral. 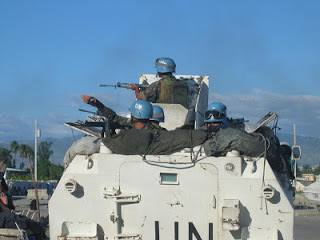 However, the MINUSTAH spokesperson said that a rock hit the Haitian guy. I didn’t know a rock sounded like rifle shots when it strikes someone in the head. 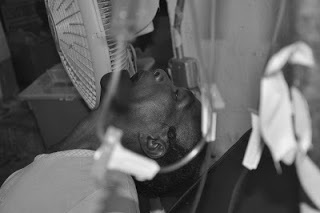 MINUSTAH never admitted to killing this man. And now the UN says they won’t pay up for the cholera outbreak that has killed over 8,000 Haitians from October 20, 2010 until today. And those are only the cholera deaths that we have recorded. Many cholera deaths in Haiti’s mountains and slums are never recorded.